This old schoolhouse in Annawan, IL is full of great character. Tall ceilings with exposed tin panels, and a unique layout. 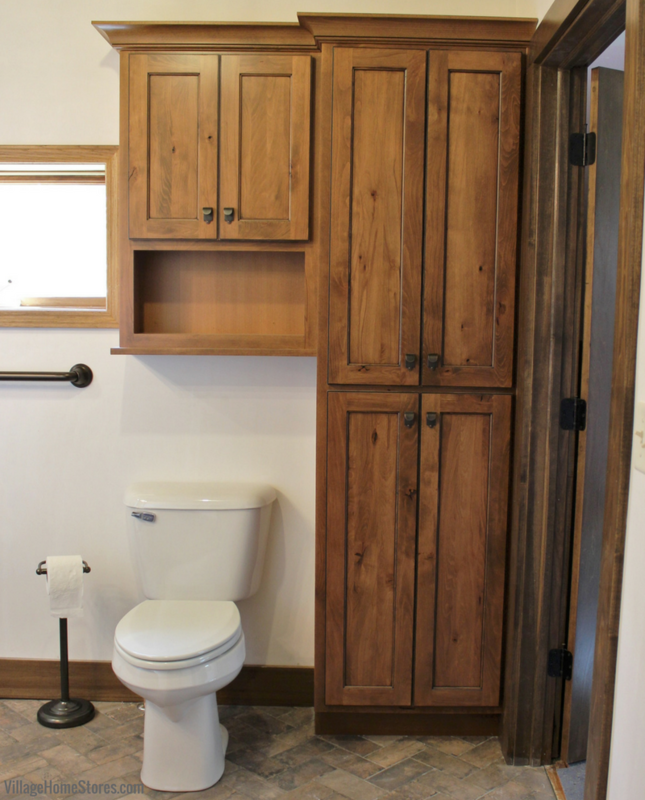 Rustic Beech wood Koch cabinetry in the Briarwood stain and a Black Accent Glaze was the perfect choice to help showcase the other rustic material selections for this remodeled bathroom space. 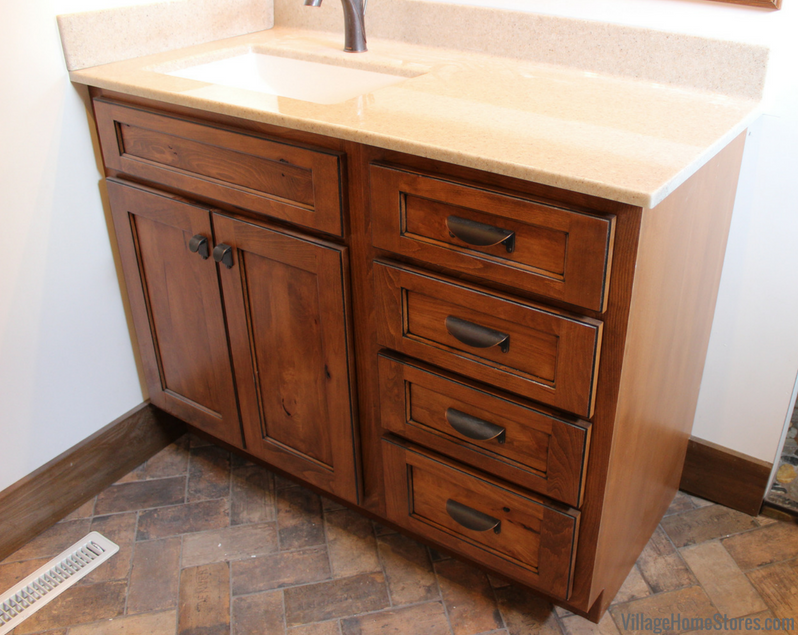 The main wall includes a vanity cabinet with an offset sink and stack of drawers. 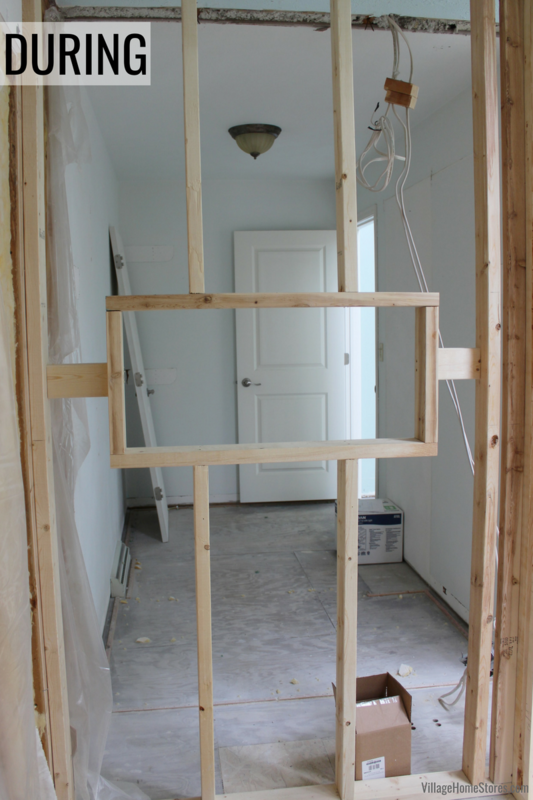 We ordered a matching mirror molding to wrap a custom-sized mirror perfect for the room. 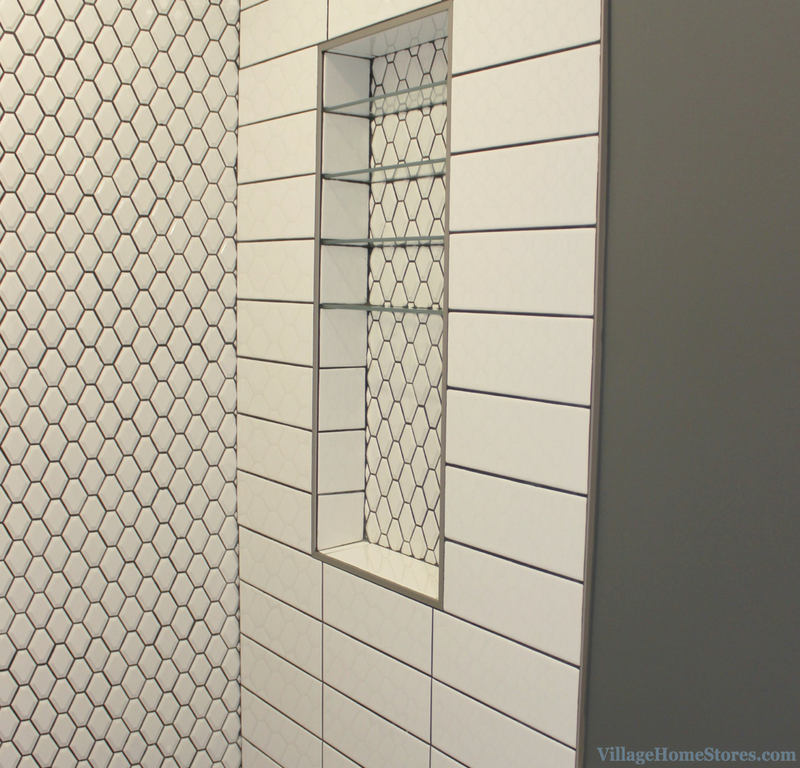 The new tiled shower is accessed right behind the vanity wall. 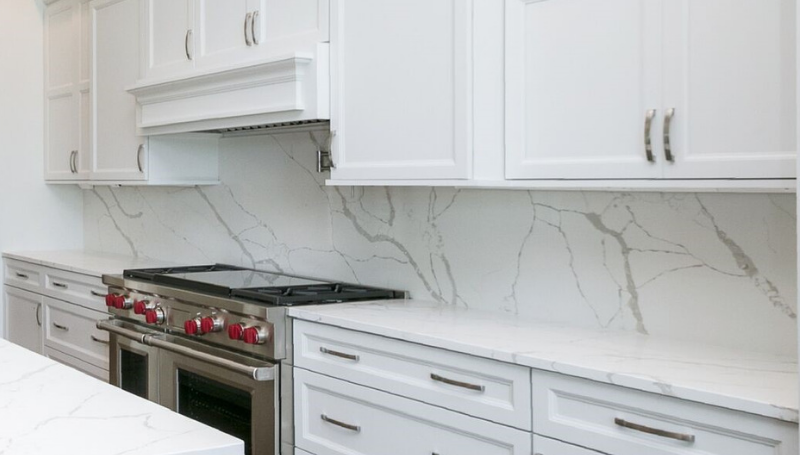 When remodeling, nobody wants to see wall surface go unused. 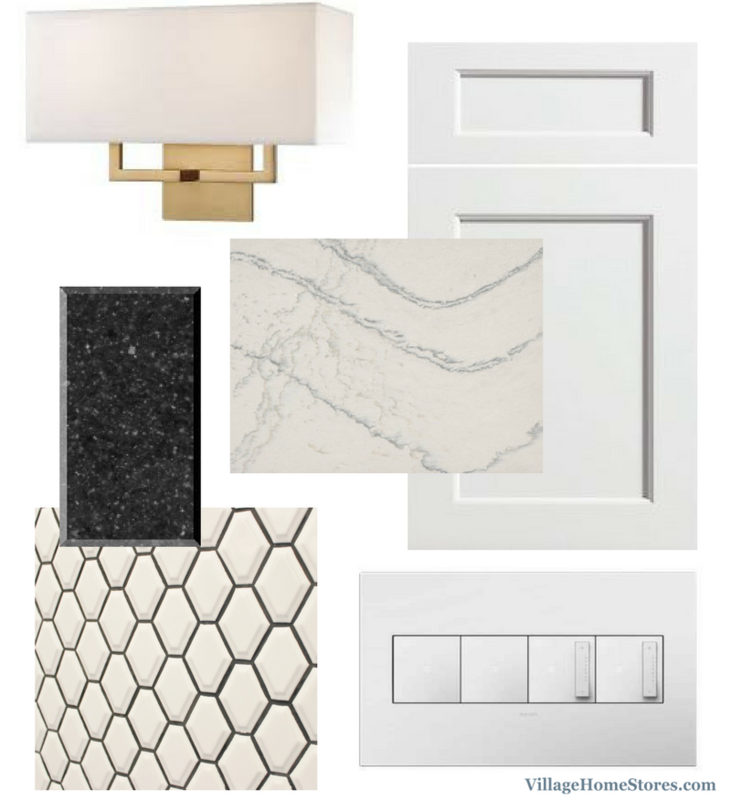 Bathrooms can become a tricky area to add any storage space once all of the areas are designated to a fixture location (stool, sink, doorway, window, shower, etc). 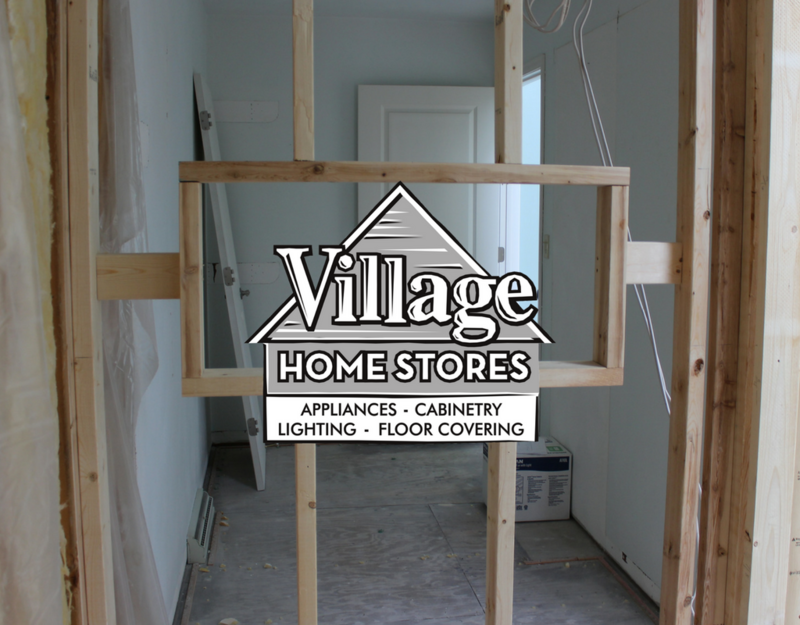 Village Home Stores also can order and install interior doors to match your remodel space. This bathroom has two walls that have each been fit with a new door. One is accessed from the nearby bedroom, the other is from the hallway. With two doorways and a window, available wall space was limited. But we found some room for storage. The window wall is now home to the stool and a lot of great storage. A tall linen cabinet fits in the corner of the new space. 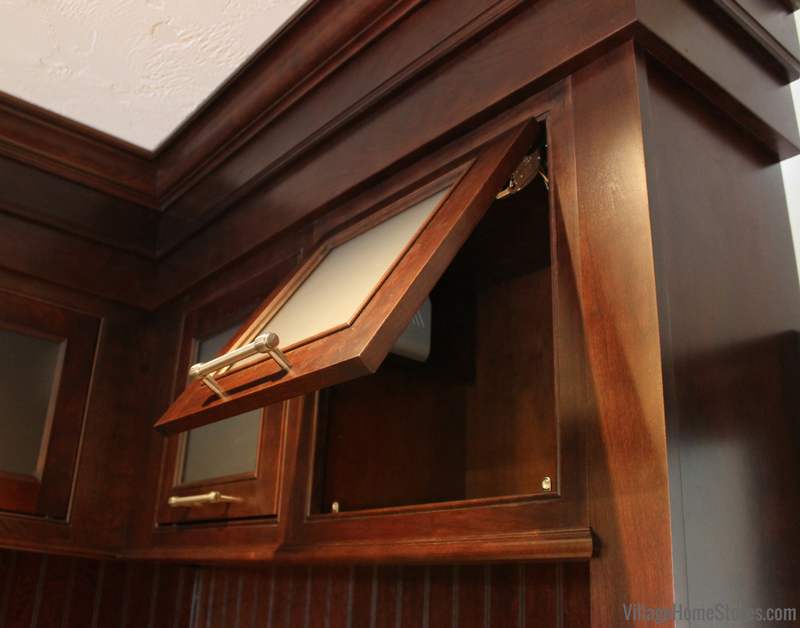 A linen cabinet can be helpful at any depth. 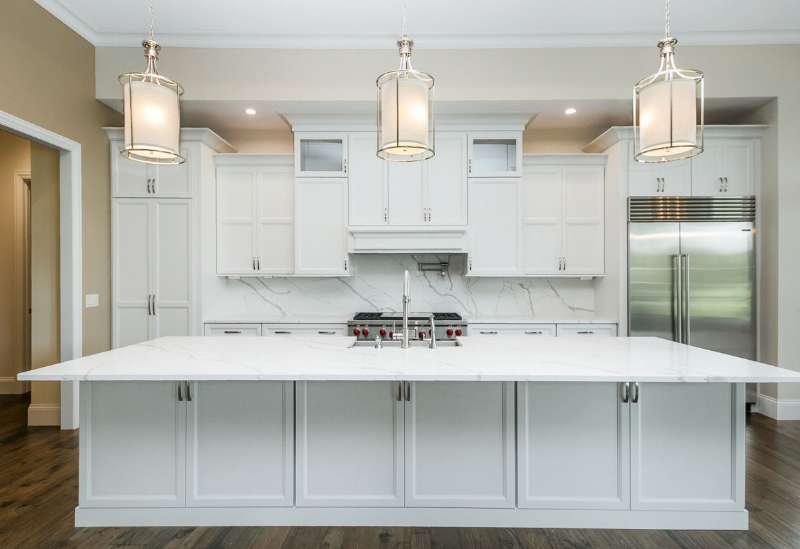 Standard depths are 12″, 18″, 21″, and 24″ deep but we are able to order a custom depth cabinet to perfectly fit any space and utilize as much of that area as possible. Even just a 12″ deep linen cabinet can offer so much shelf space for toiletries and linens. 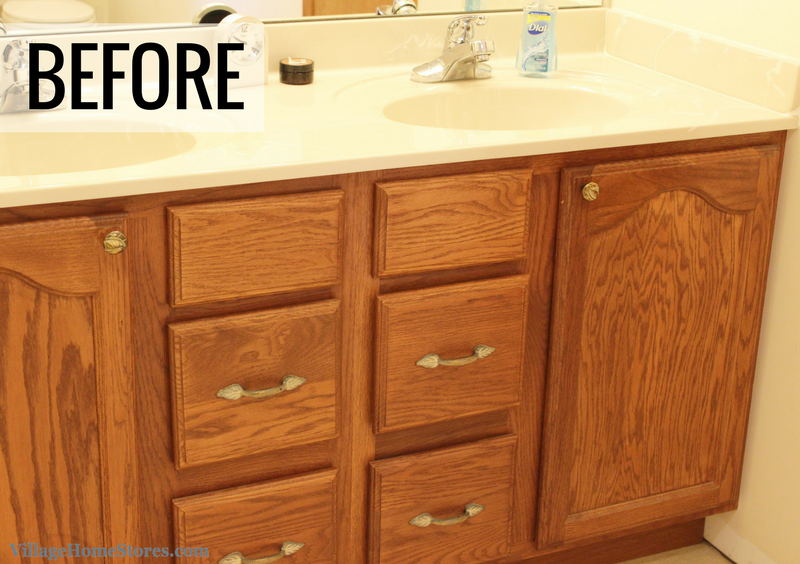 A cabinet commonly used in a bathroom is a “toilet topper” cabinet. 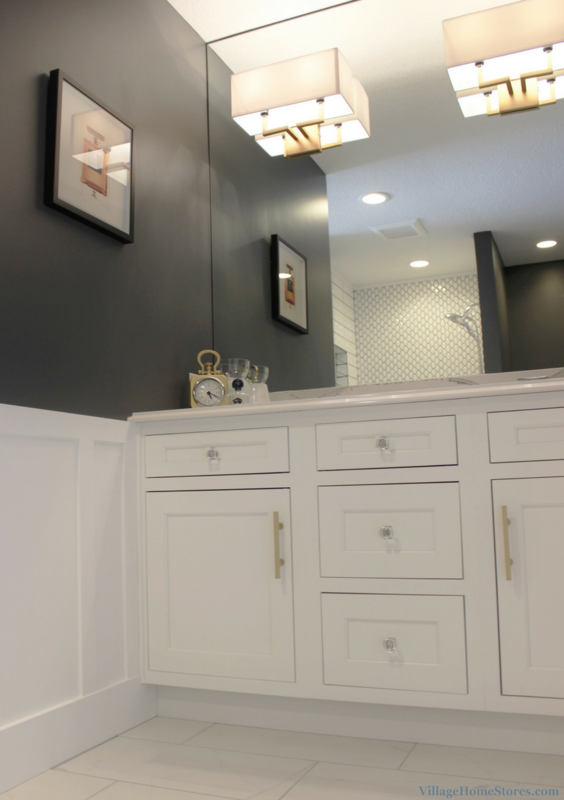 With bathrooms trending away from medicine cabinets and instead using more framed mirrors, these can be a great solution for small item storage. 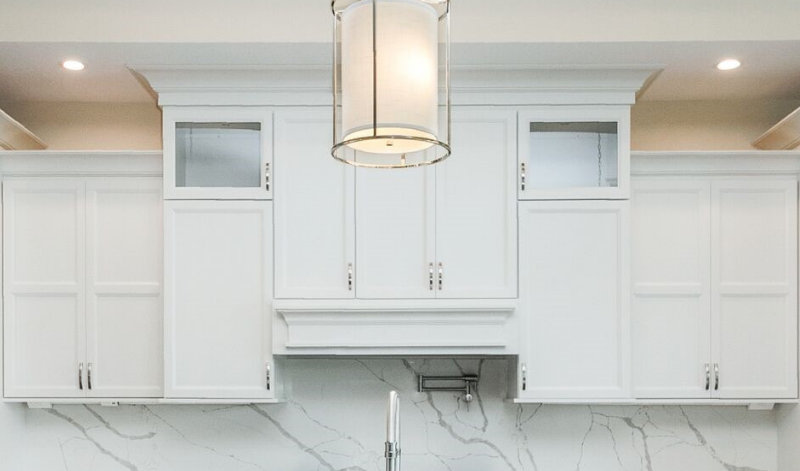 Deep enough for rolls of toilet paper, and typically including a towel bar or open shelf below, these cabinets are a great addition to any space. 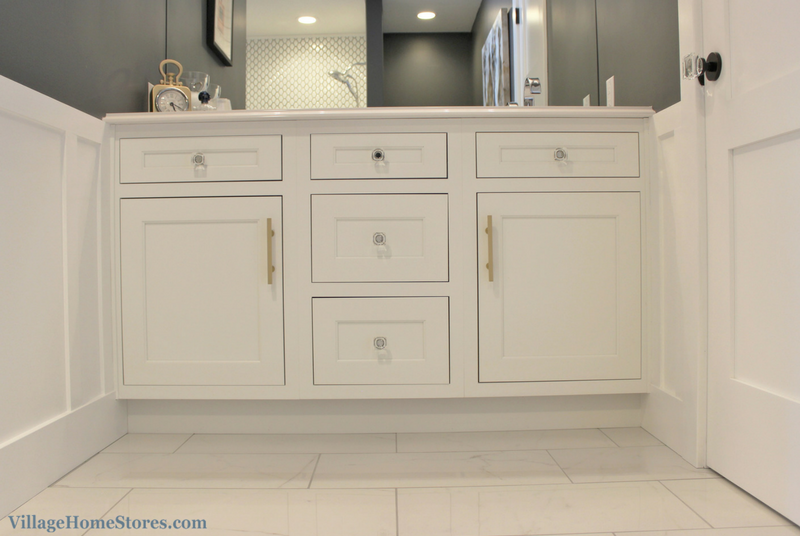 Even with all of the extra storage cabinets, there is storage available within reach of the bath vanity area itself. 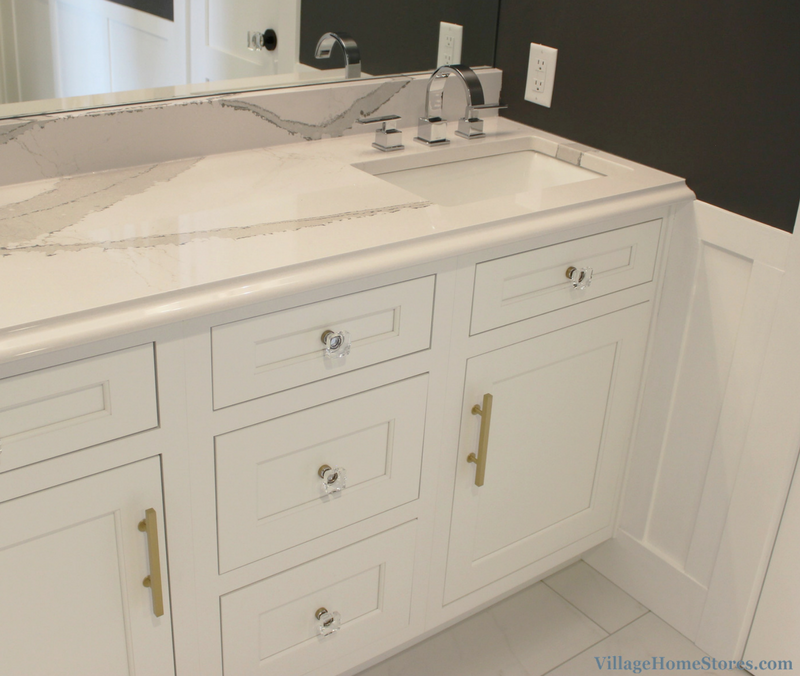 A single sinkbase cabinet and a stack of drawers are arranged with an offset vanity bowl. 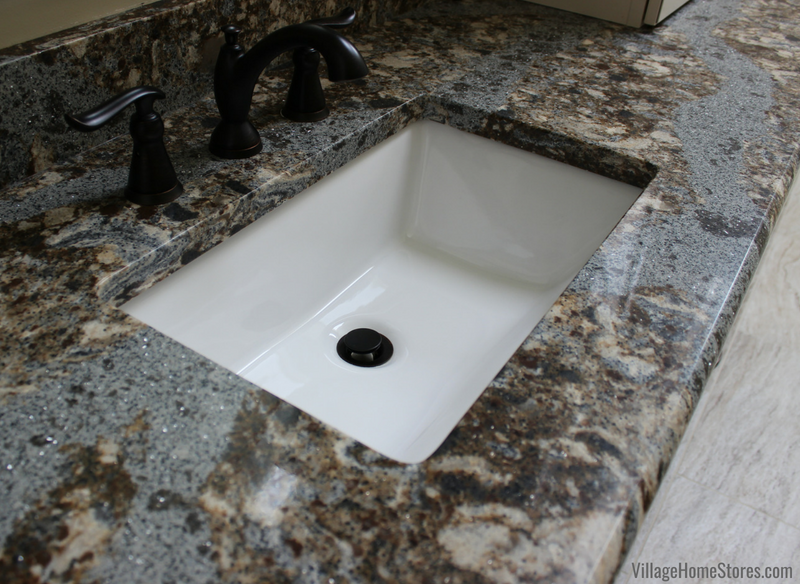 Our Onyx Collection vanity tops are a great option for a bathroom. This top is in the “Prospect” color. 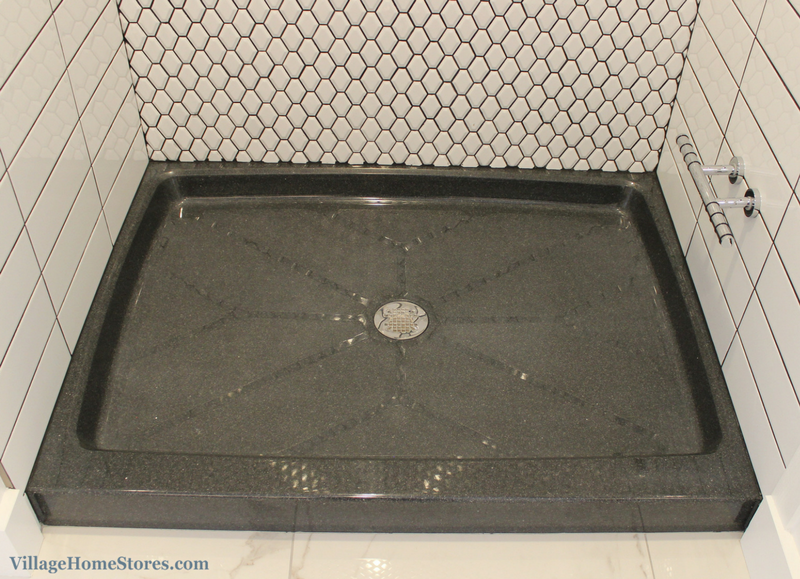 Seamless, integrated bowls (shown here with a two-tone “Icicle” bowl for the illusion of an undermount sink) and the ability to fit any custom layout or space. 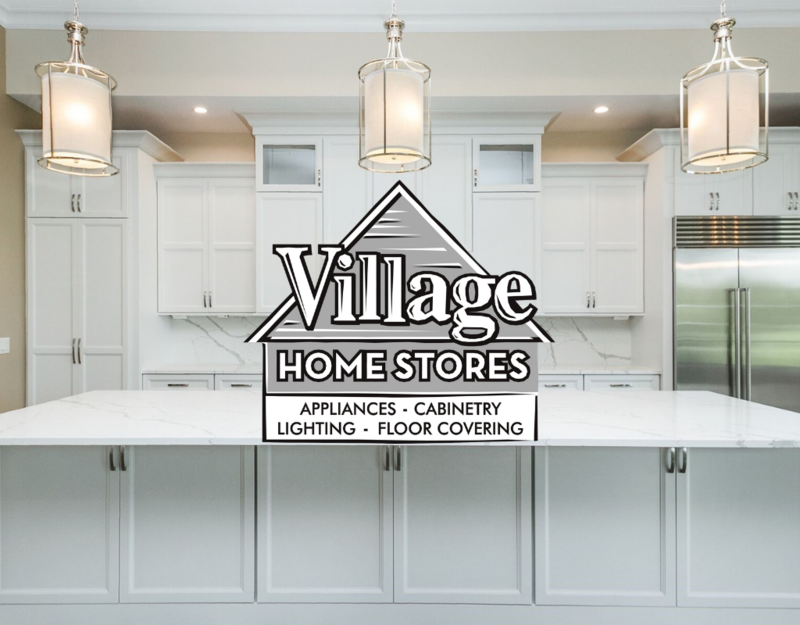 Ask a designer at Village Home Stores about the many color and bowl styles available in this product. 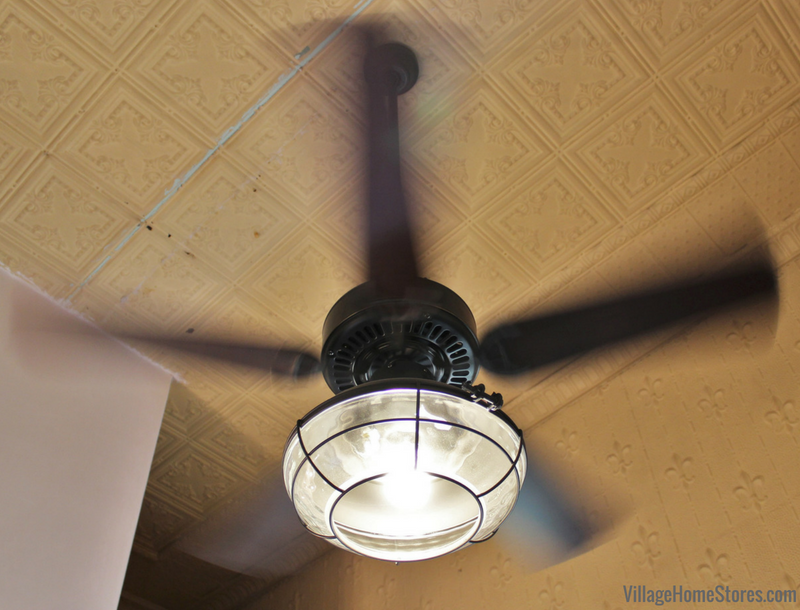 The exposed tin ceilings and textured wallpaper in this old schoolhouse are such interesting design details to let be showcased above the “new” walls of the bathroom. 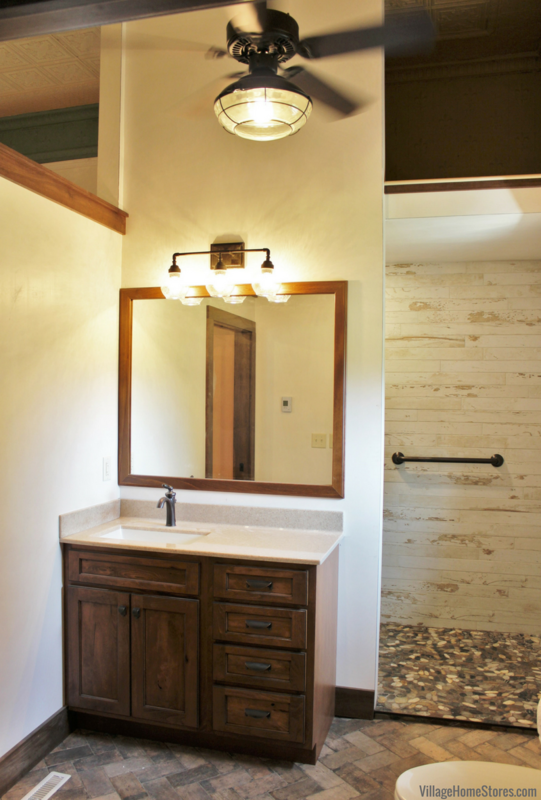 Those rustic characteristics become a great compliment to the tile materials selected for this bathroom. 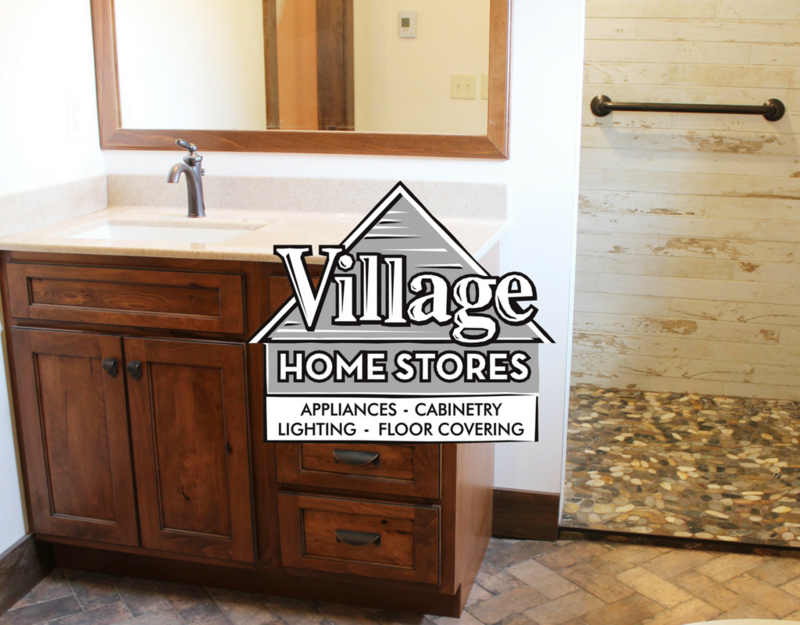 Faux brick tiles from our Chicago Brick line in the “State Street” color are installed as the main bathroom floor. 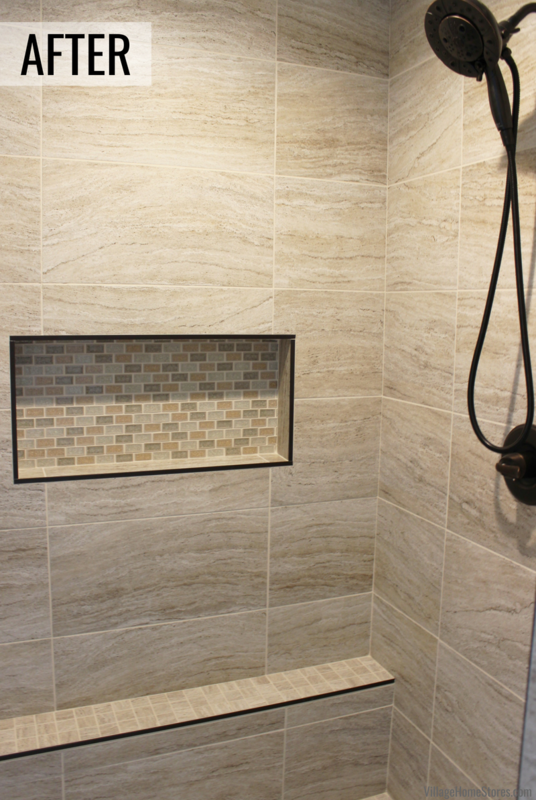 This custom tiled shower is accessed as a door-less, walk-in shower around the corner behind the vanity wall. 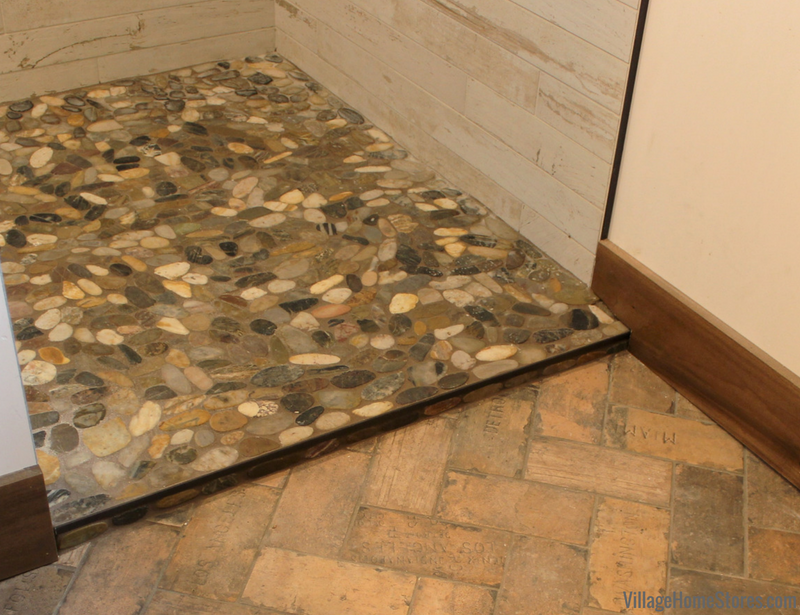 The shower floor is a Pebble mosaic named “Born Wilderness”. 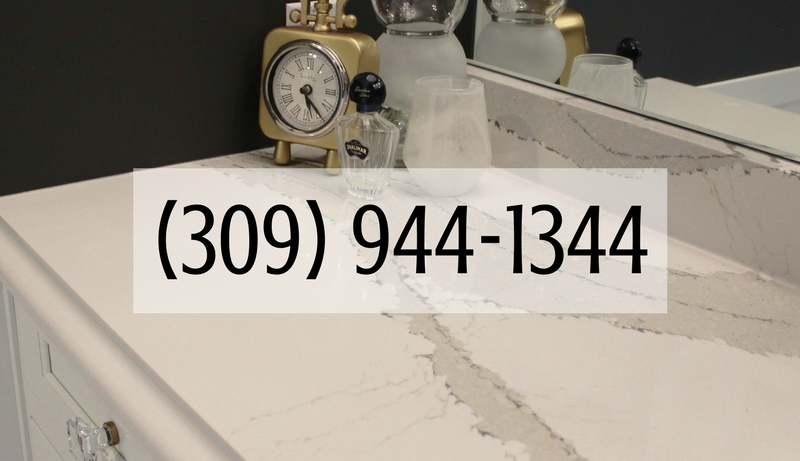 “Look-alike” tile is a great trend that helps add great textures to a space in a more practical tile surface for the homeowner. 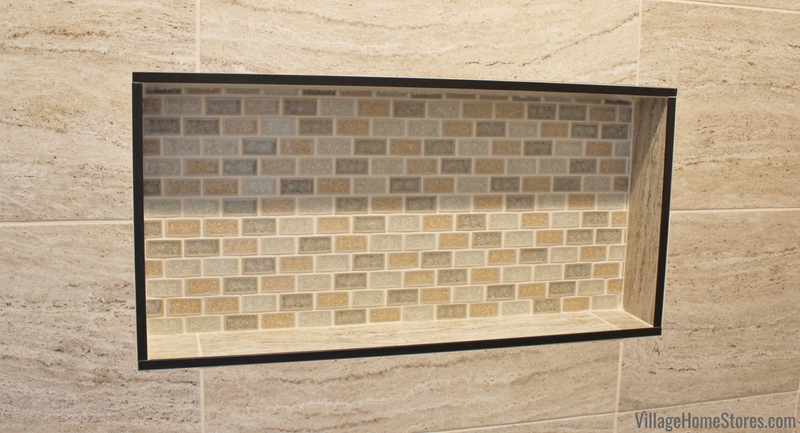 We have seen this brick-look tile used in so many unique spaces since we began carrying it. 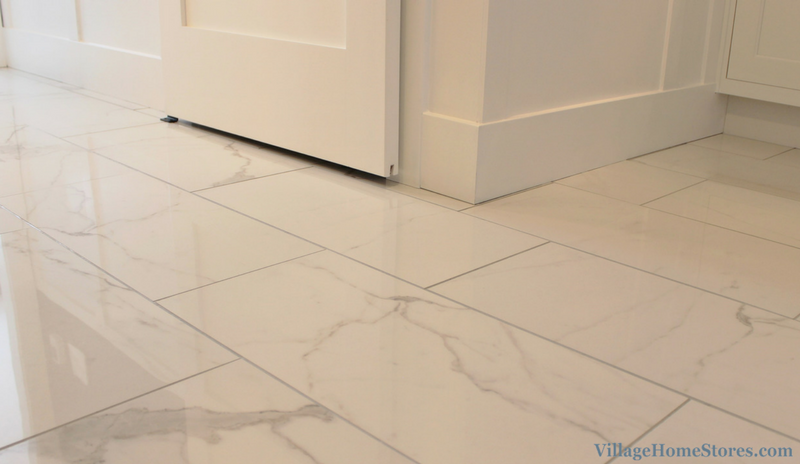 It works well as a floor and wall tile. If you would like to see it, we have a large area of our new lighting showroom with it installed as a floor tile. The wall of the shower is another look-alike tile. 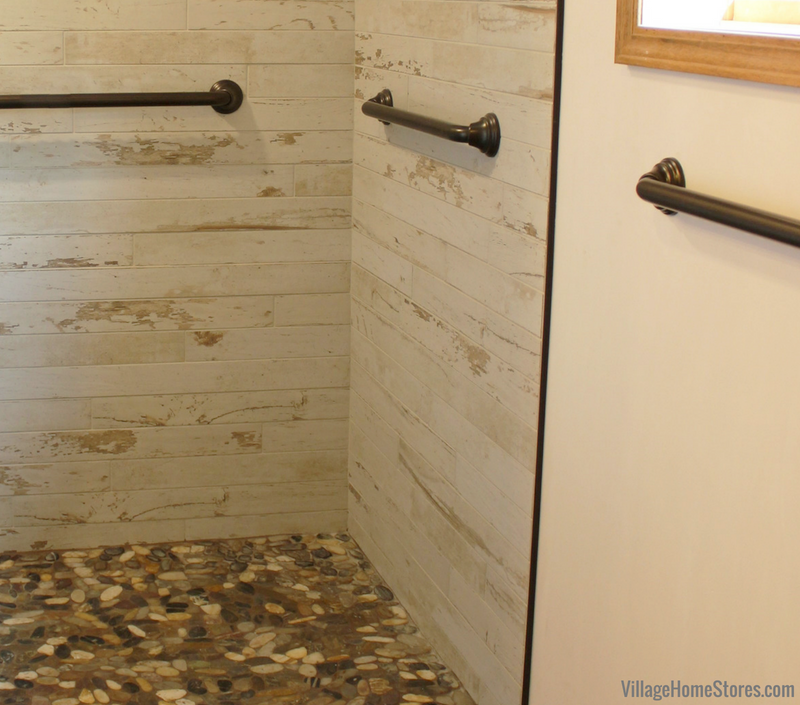 The look of a rustic barnwood but in a long, plank wall tile. 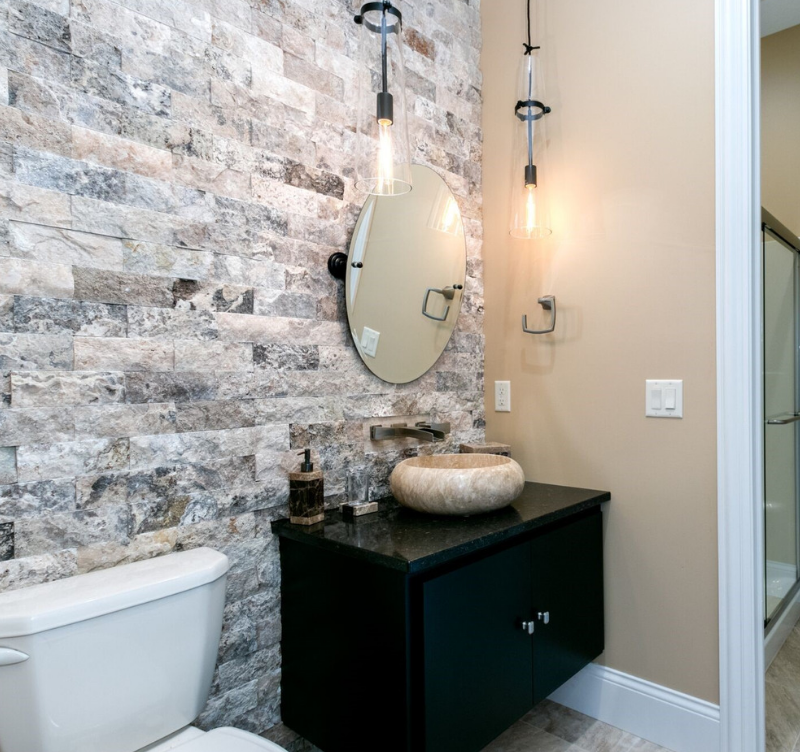 The “Charleston” 3″ x 36″ tiles add such a blend of textures and natural colors. 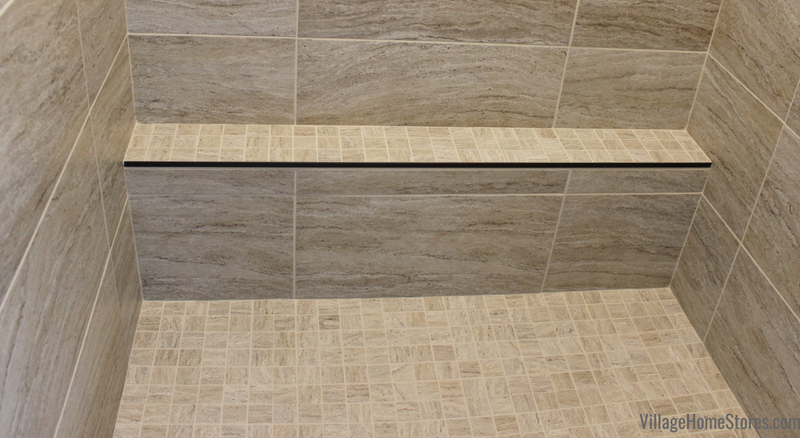 We included plenty of grab bars in the new shower space. 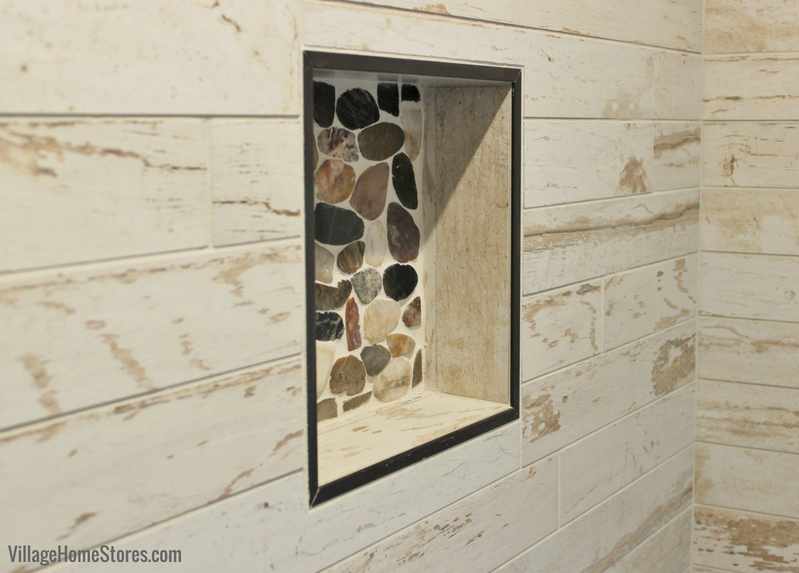 A custom tiled niche was added on the interior wall with the same pebble tile used as an accent in the back. 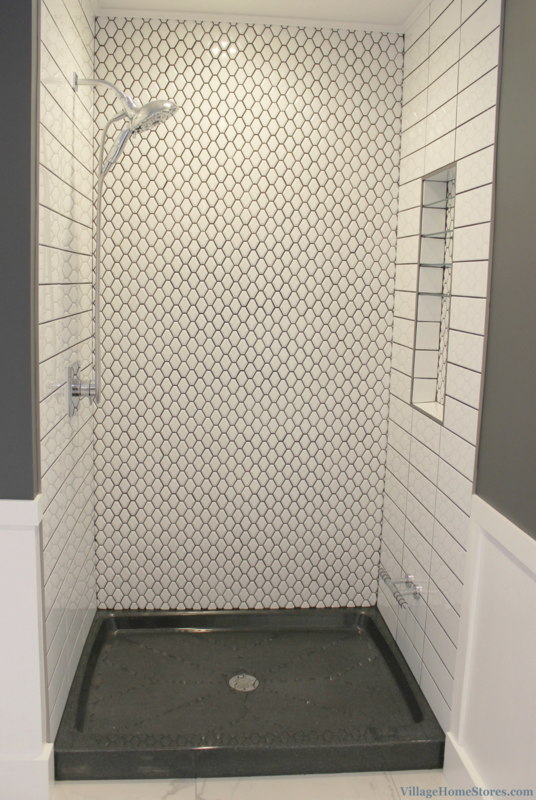 Check out this ideabook on Houzz full of our own custom tiled shower ideas and inspiration. 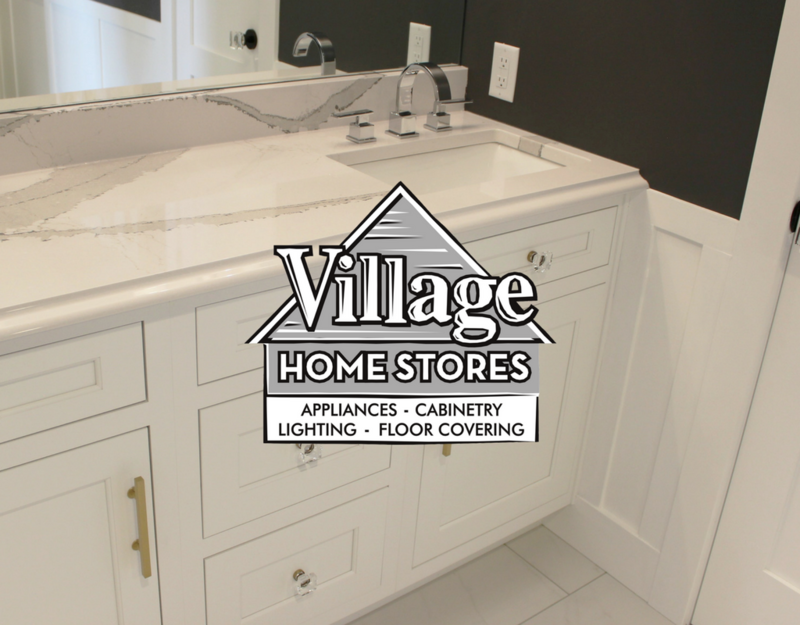 Are you ready to start the conversation about your own bath remodel with Village? 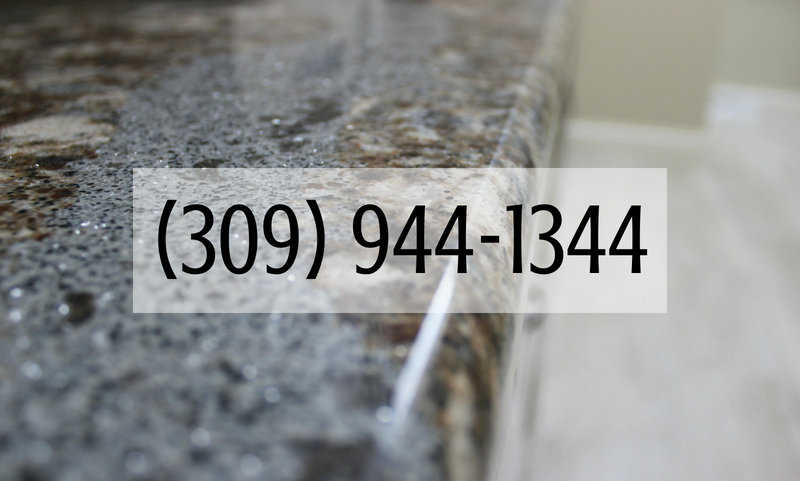 Your first step is to reach out to our team. 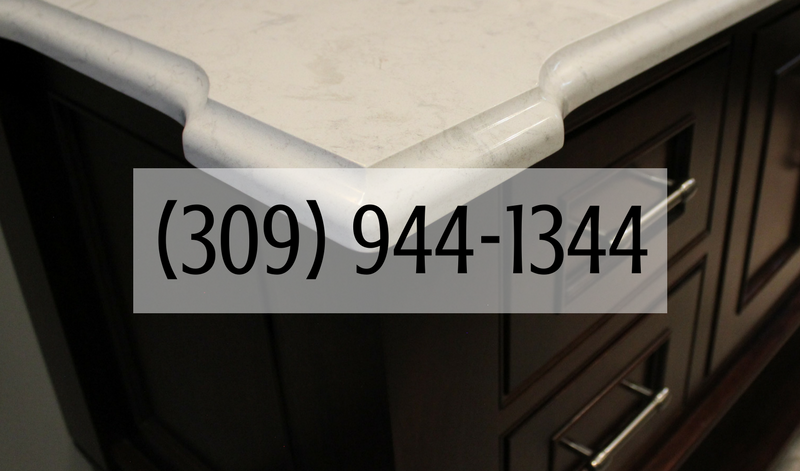 You can call us at 309-944-1344 or complete this short online form and a member of our team will reach out to discuss your project. 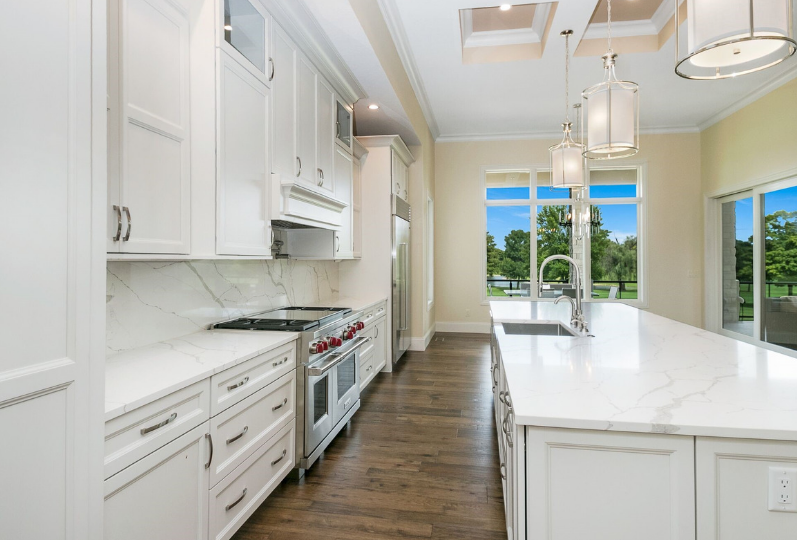 Down the hall from this stunning kitchenette we shared recently is a remodeled bathroom packed with storage, function, and style. 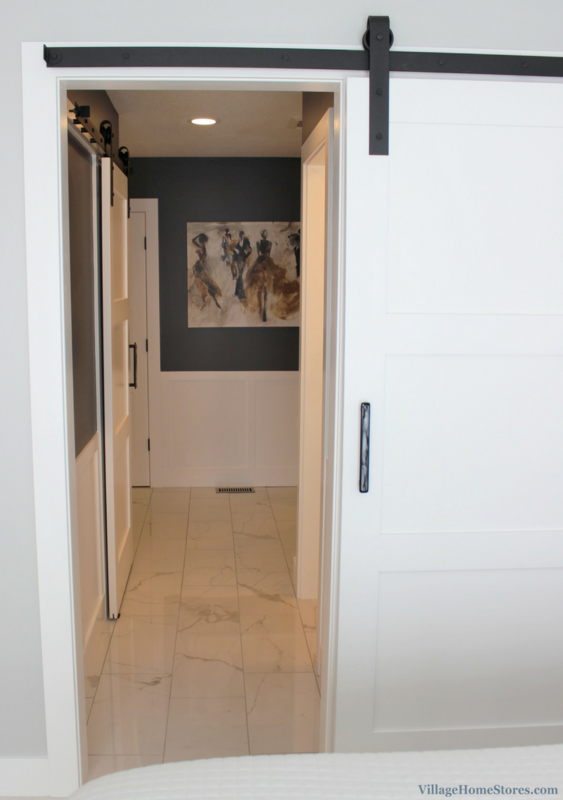 With a pool out back, this walk-out basement was in need of a large functional bathroom space ready for busy Summertime pool days. The vanity area is gorgeous. 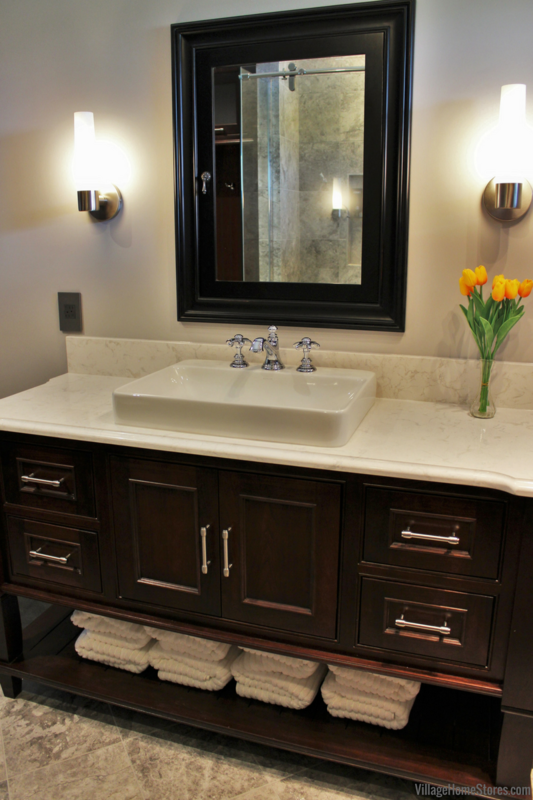 A furniture-style vanity with a medicine cabinet above surrounded by two wall sconces. An open shelf below is perfect for stacking extra towels for guests. 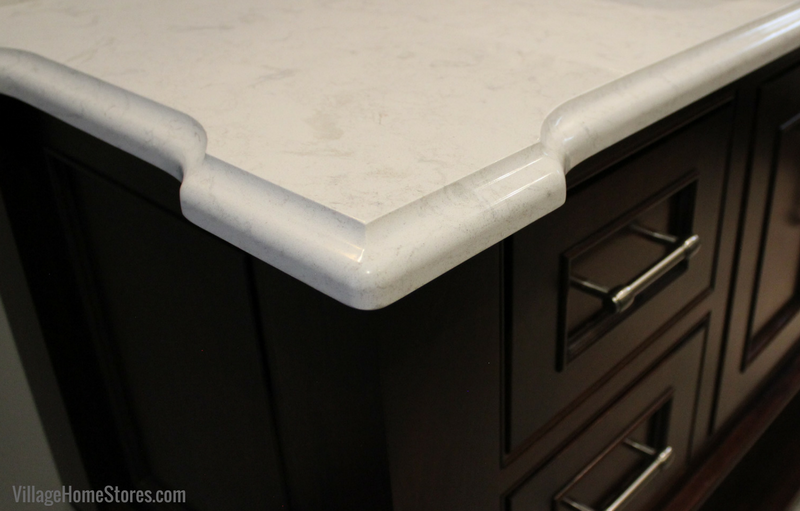 The furniture look of the Dura Supreme vanity is enhanced by the edge detail on the Cambria counters. 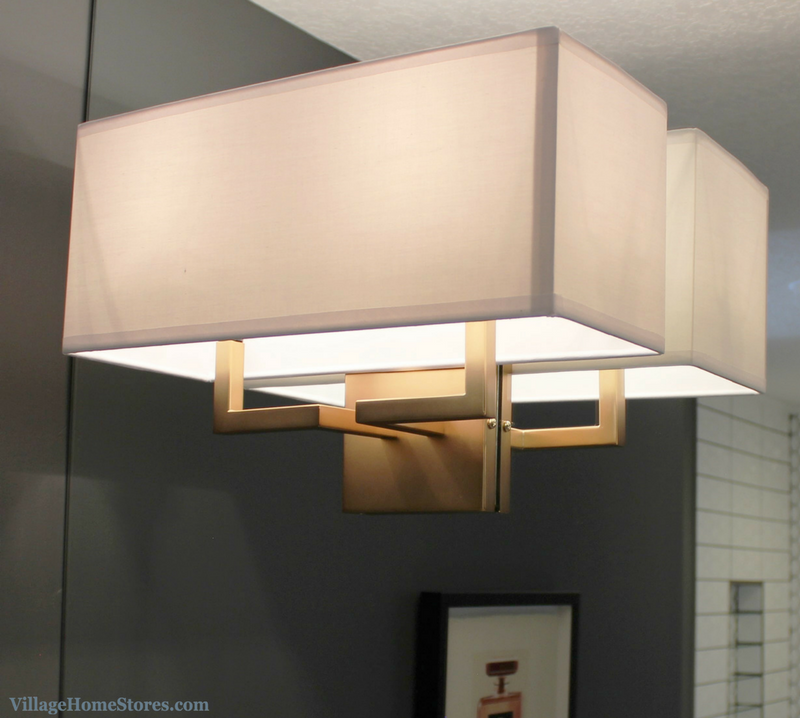 Each corner swoops out an adds a details that the light catches. 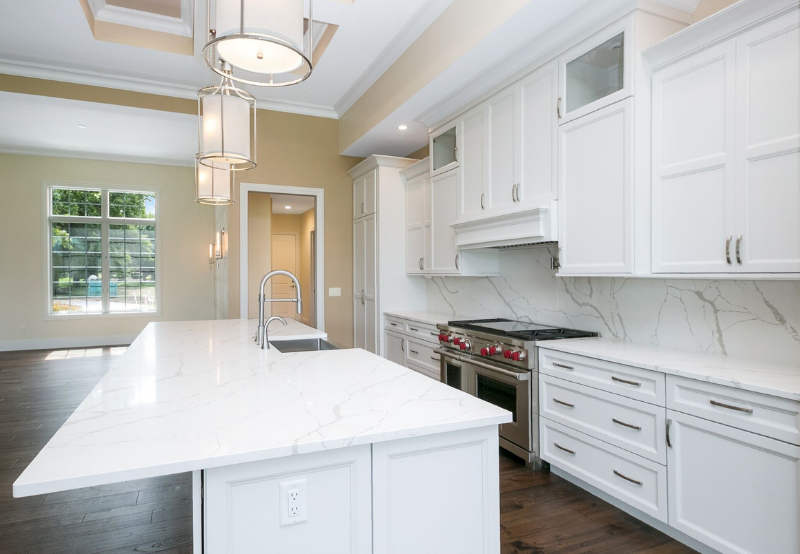 Cambria Quartz in the Torquay design gives the polished look of marble in a durable and non-porous engineered quartz. 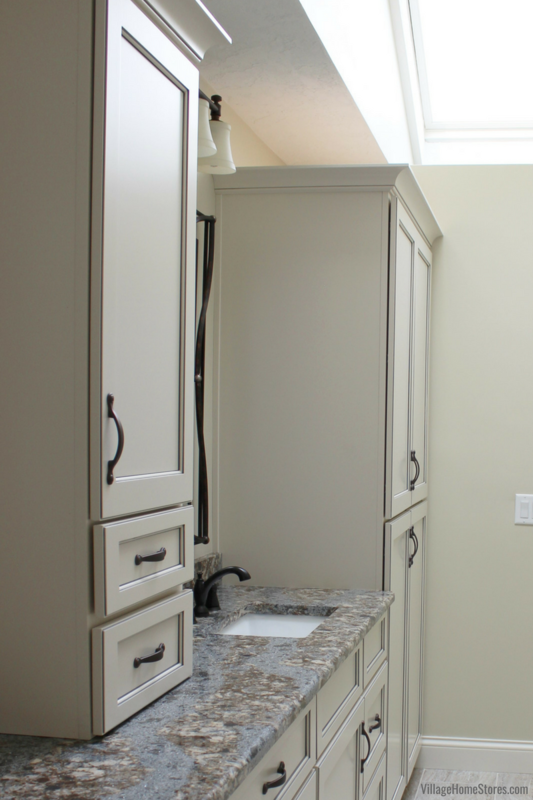 With this busy bathroom being so close to the pool, a secondary laundry area was on the wish list. 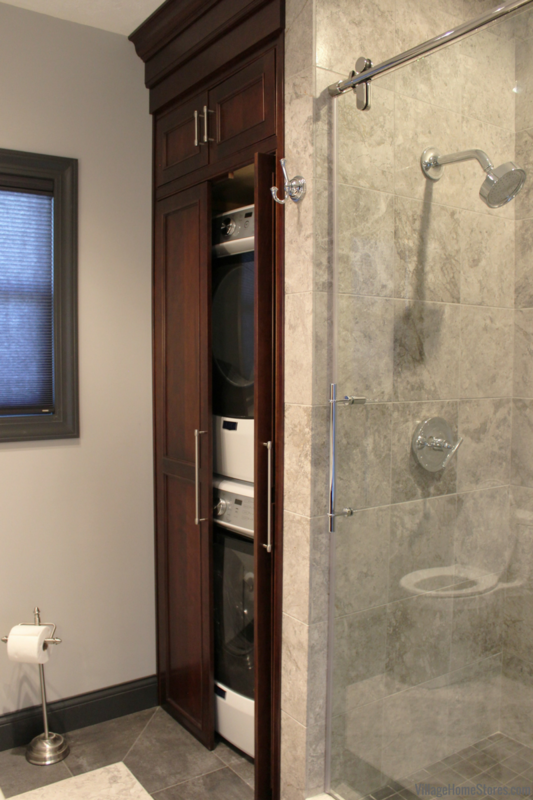 We were able to design an area that hides a stack-able unit right within the bathroom. 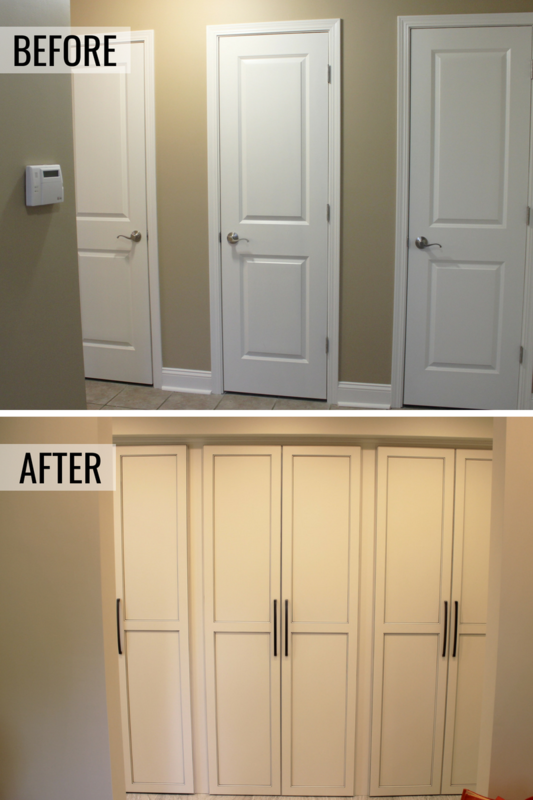 Hidden pantry front doors aren’t just for pantry areas! 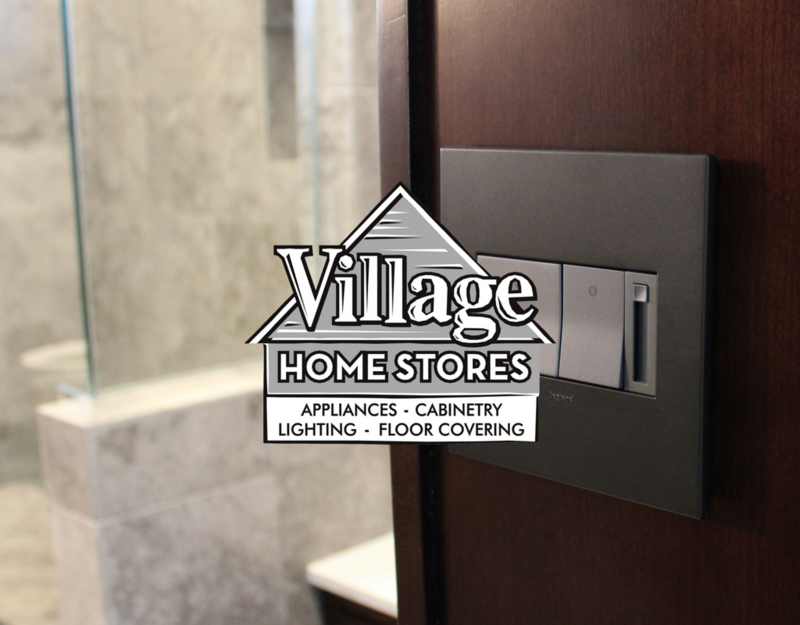 And with the Inset door style selected, the doors can roll back with pocket door hardware and allow full access to the laundry. 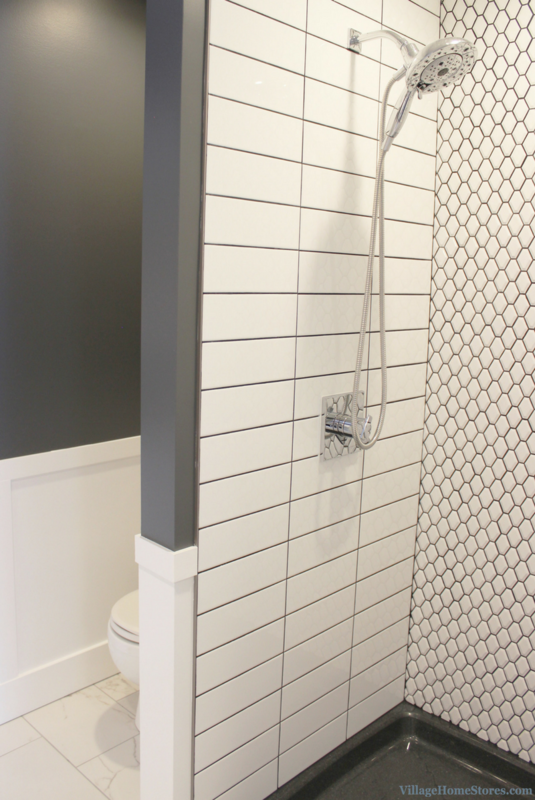 A custom tiled shower in a bathroom allows you to truly make the most of your space. 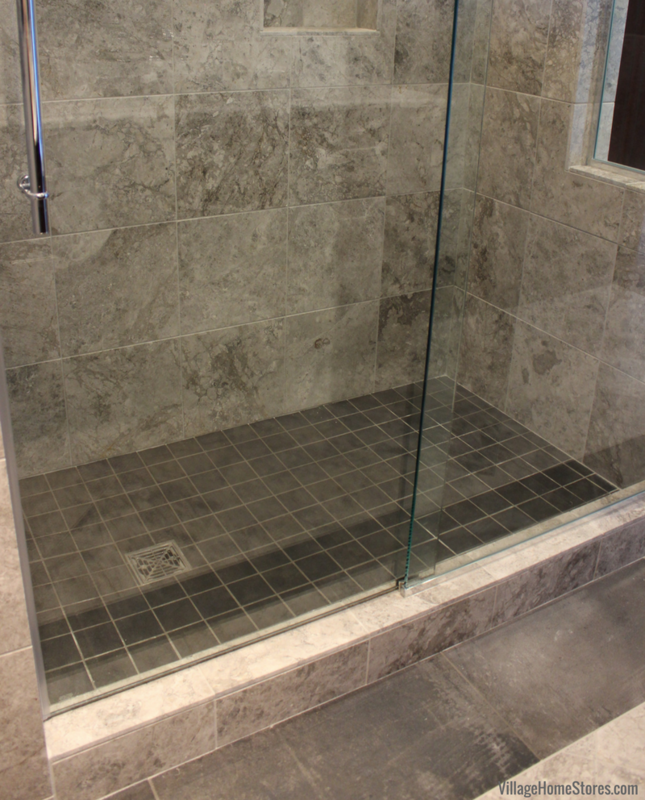 Plus the look of carrying a tiled floor into a shower helps to make the room seem larger. This look is only made stronger when you pair it with a glass door entry. 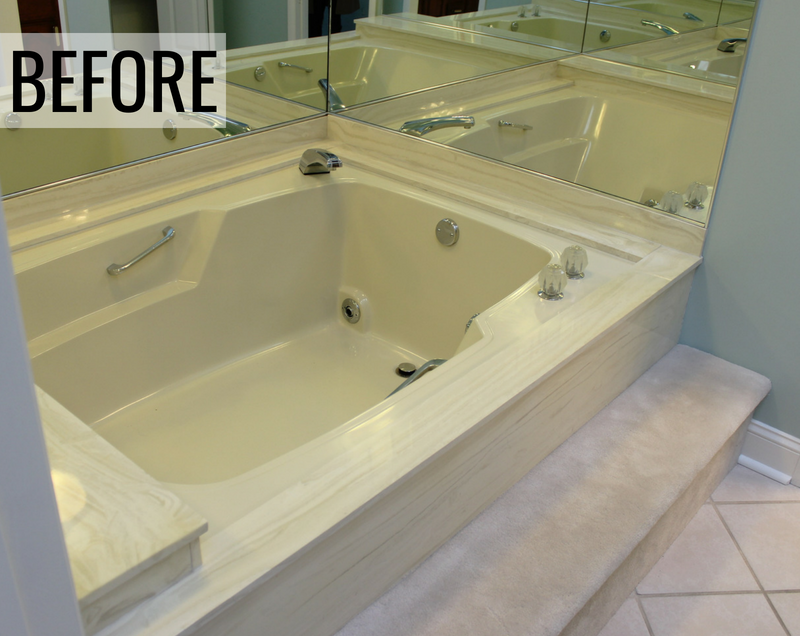 In this bath we were able to include a full glass wall and even turn the corner with a small section of glass. 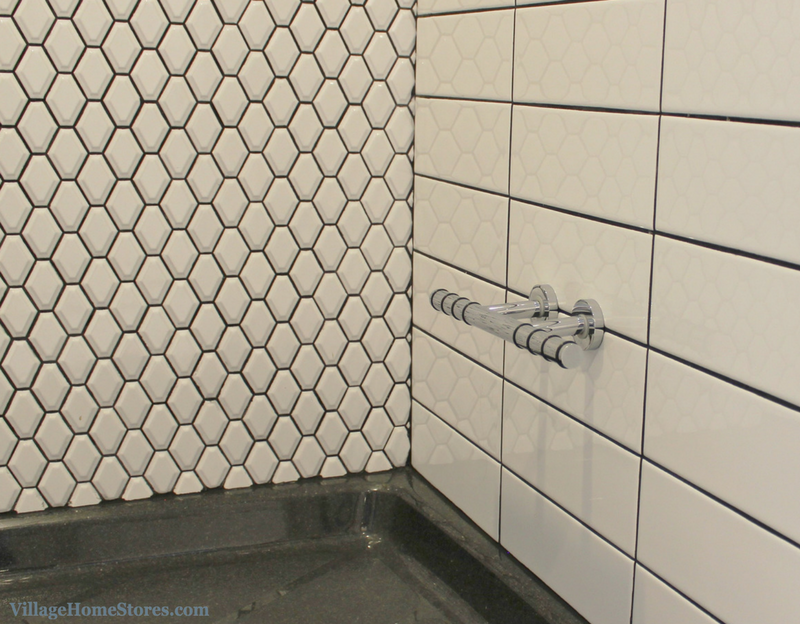 12″ x 12″ wall tiles and 3″ x 3″ floor tiles in the shower plus a custom niche for toiletries. 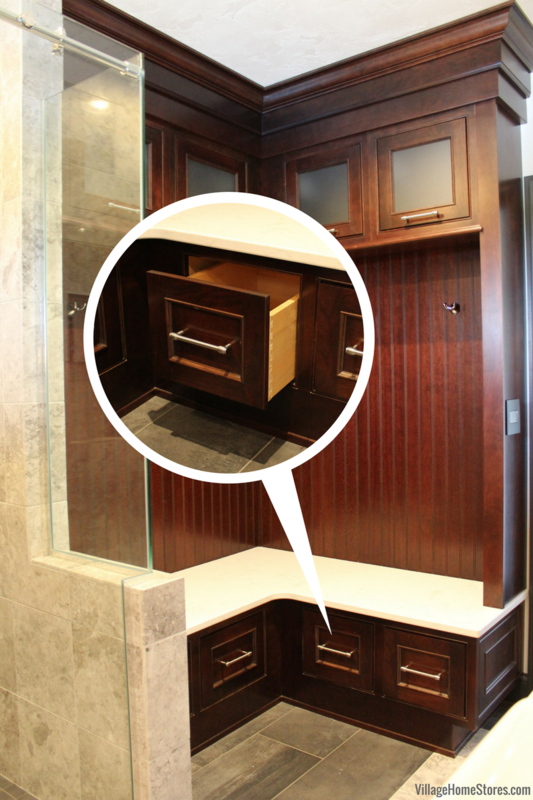 Even with a shower this large there was enough space to include a custom cabinet locker area at the bathroom entry. The unit hugs the entire corner all the way to the door. 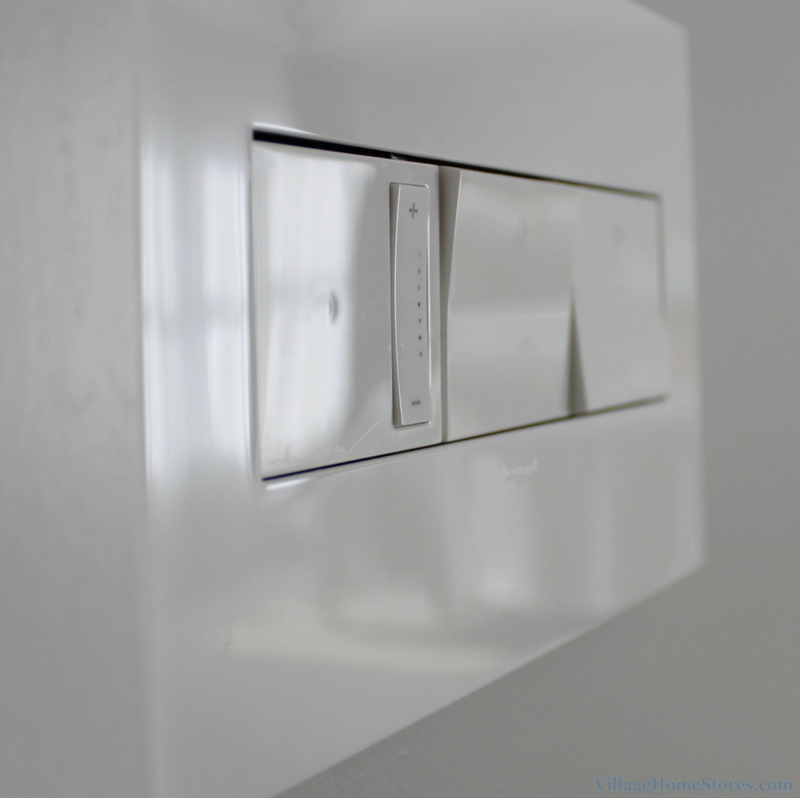 Why stop at the wall switch if you can just include it in the design? 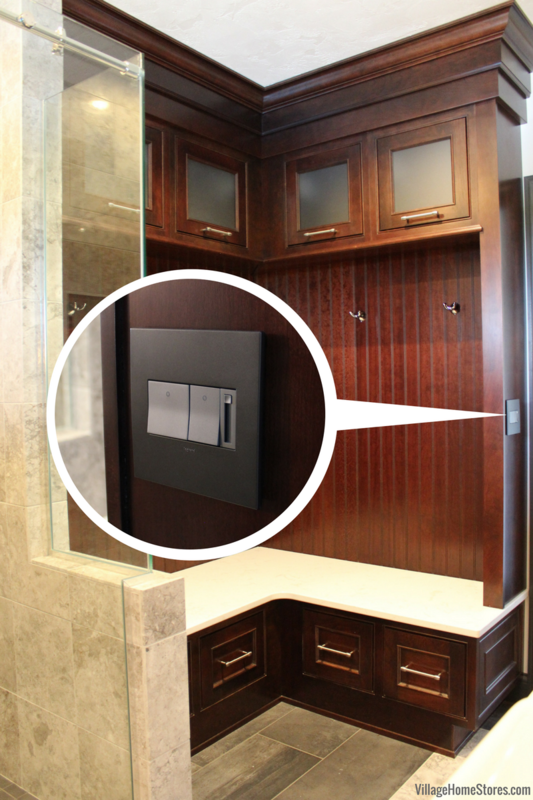 We used the clean design and style of our Adorne Series of switches and the look is great. An L-shaped bench with beaded panel walls and robe hooks was installed. We stacked crown molding so that the locker bench area stretches all the way to the ceiling. 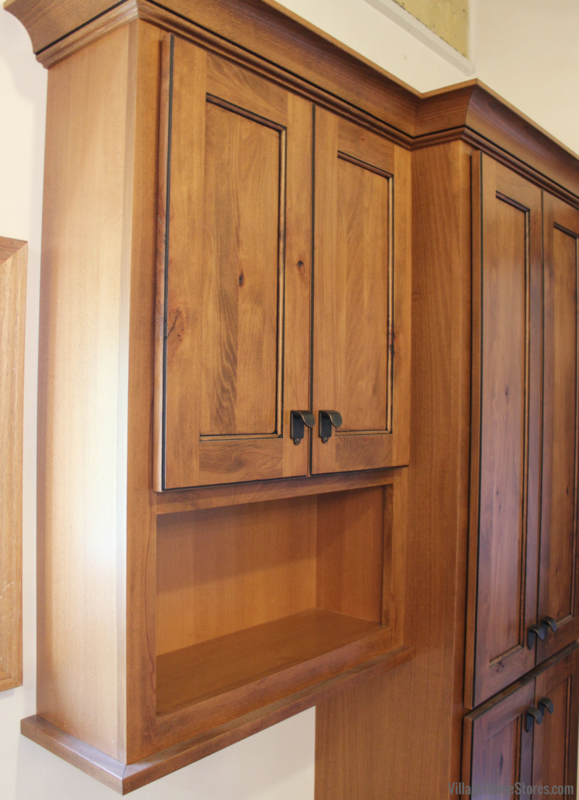 The Chapel Hill doors are inset into the faceframe and the top section of cabinets here are top-hinged. 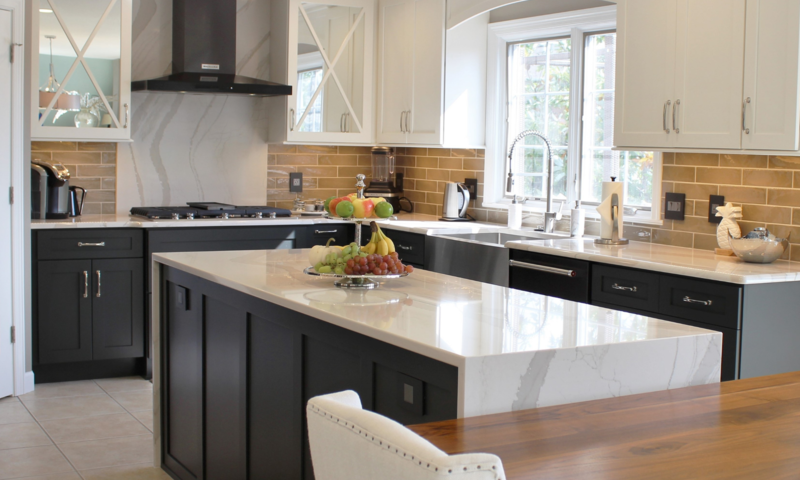 We love the use of frosted glass in the Chestnut Cherry cabinet. Below the bench is even more storage in drawers. Imagine a busy pool party weekend and each guest getting a section of this locker. A wonderful way to keep the clutter contained. This bathroom space is so beautiful and functional. We love how it turned out. 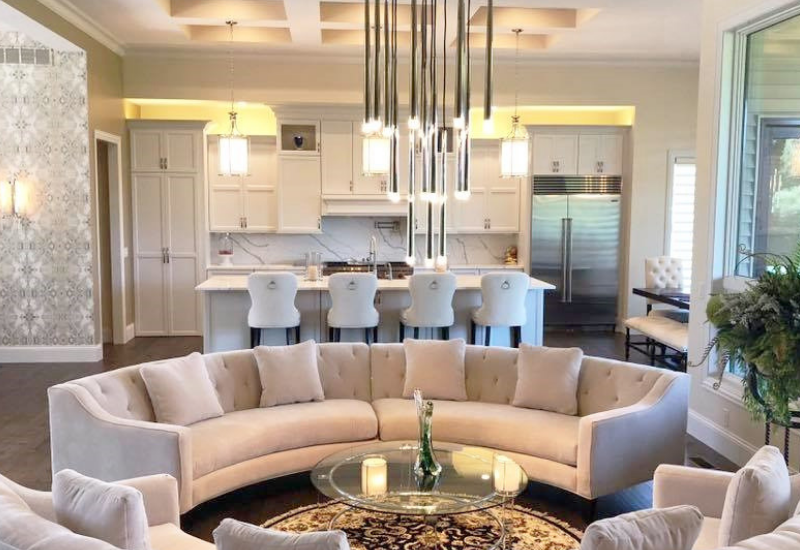 Have your own dream to make a space in your home more functional? 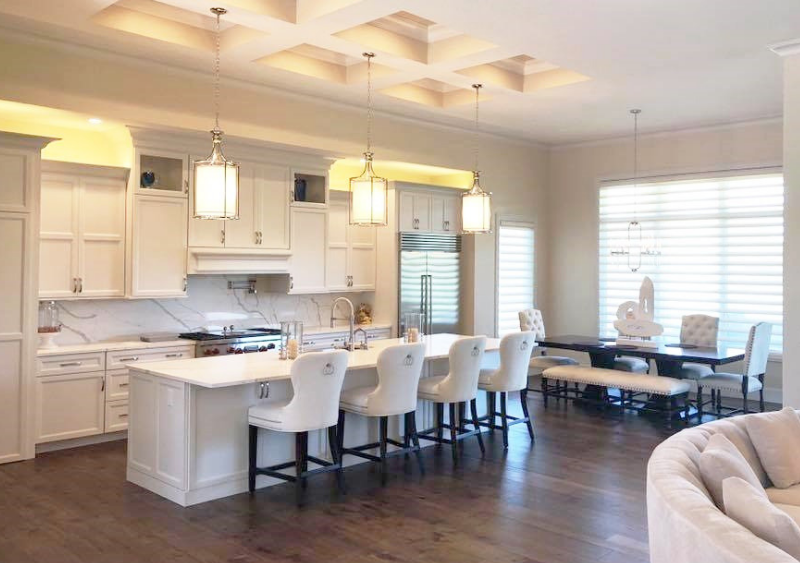 We can help you visualize and make it happen! 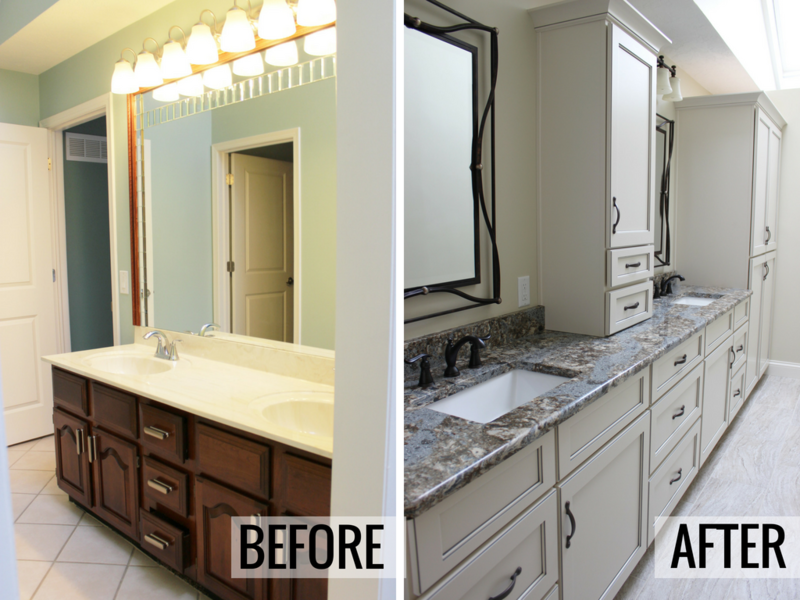 Remodeling a bathroom or adding another bathroom to a home can be a rewarding investment in your home. 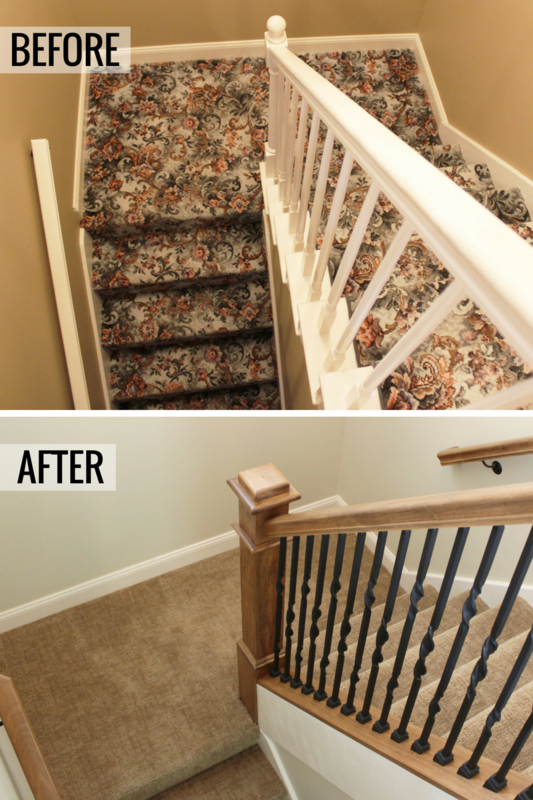 Contact one of our designers today and they will walk you through our process. 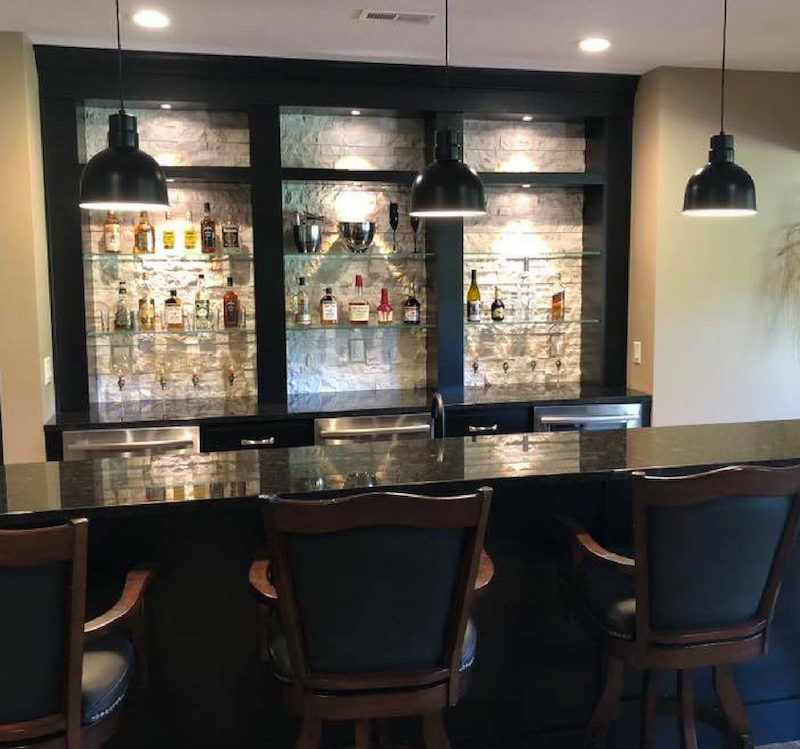 An expert design and quality materials for you and your own contractor or let our team manage it all from start to finish for you. Either way your first step is the same. Reach out to our team for an appointment. 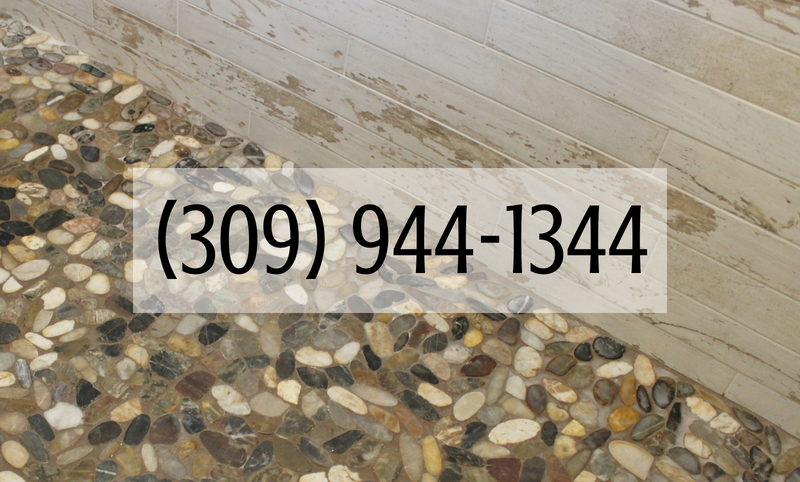 Call us at (309) 944-1344 or complete this short online form and a team member will be in touch.